Growth and management of unstructured data continues to present major challenges for IT. Unstructured data is growing faster than ever thanks to the proliferation of endpoint devices that can capture data as well as richer file formats and the resulting larger data sets. On the storage front, ESG believes that scale-out storage platforms that essentially virtualize the underlying hardware environment and provide a scalable and easily managed file storage environment will be the dominant hardware architecture moving forward, and indeed that is the case across some market segments. But the midrange NAS market lags—midrange file sharing is still largely the provenance of scale-up storage silos. That’s because few vendors have tackled this segment—but it is an important growth area and one that Overland is taking on with its SnapScale X2. Overland Storage SnapScale X2 represents the latest entry into the scale-out NAS market. It is an “infinitely scalable,” high performance and availability scale-out NAS system all wrapped up in a global namespace for ease of use. Embedded with the X2 is Overland’s RAINcloud OS. RAINcloud OS is the global namespace layer that combines traditional embedded NAS functionality—a file system, volume manager, and data protection—into one scalable and flexible storage management layer that can span all nodes within a given cluster. · Scales to 512PB (raw) in a single cluster which is more than enough capacity for today’s mid-sized enterprise. The initial configuration starts with three nodes and four drives per node. Scaling can be done at a granular level by adding additional drives or full nodes, for “just in time” scalability. Rather than targeting general purpose NAS environments (though X2 provides an attractive alternative for fast-growing user home directories and should be considered for that use case), Overland is targeting vertical industries that generate lots of content and really need to scale performance in lockstep with capacity—as X2 can. These are industries like manufacturing and design, that are dealing with ever richer and multidimensional CAD files, for example; or video surveillance which is dealing with more cameras at a higher resolution than ever before; and government and education that is expanding through eLearning platforms that can support rich non-text formats like audio and video—just to name a few. Growth and management of unstructured data continues to present problems for IT. 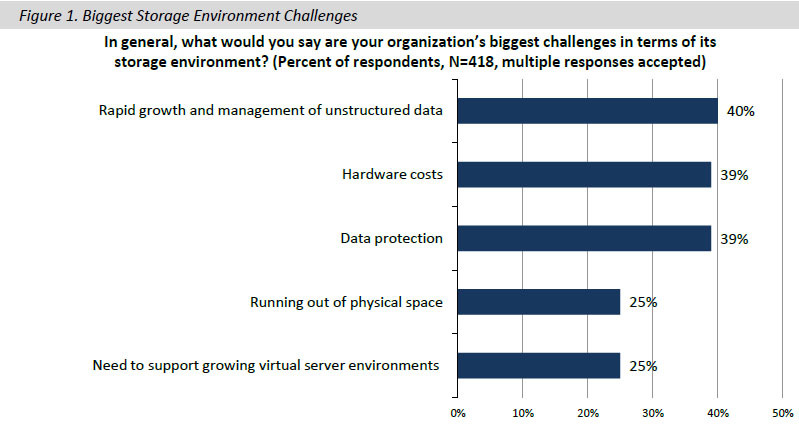 In fact, in a recent survey of over 400 IT professionals responsible for evaluating, purchasing, and/or managing data storage technology, the rapid growth and management of unstructured data was cited most often (40% of the time) as one of the top storage challenges they are facing. These results are not surprising—we are faced with unprecedented unstructured data growth thanks to technology advancements across the board. Any industry that deals with imaging is seeing that growth—GIA forecasts “the global market for 3D Medical Imaging (software and workstations used in MRI and CT; and Ultrasound machines) to reach US$5.9 billion by the year 2017, primarily driven by the technological advancements, resulting in improved imaging equipment.”2 All that data needs to be stored somewhere, and scale-out NAS fits the bill to a T. Other industries that use imaging—though not hitting 3D, they are certainly growing thanks to higher resolution images and expanded imaging usage—are financial services (check images and scanned documents), legal services (scanned documents), and architectural firms (3D models). It’s not just imaging—previously mentioned eLearning and video surveillance are big unstructured data growth areas, as are cloud services (public and private) such as archive. Scale-out NAS systems can independently scale throughput and capacity by adding nodes that work in parallel to support throughput requirements, yet are managed within a single namespace as a single system image, maintaining a single system image as new storage nodes (processor or capacity). This allows users to create a massively scalable shared storage pool and drives storage efficiency. Inherent benefits in scale-out platforms provide a path to reduction in operational costs. System scalability provides an ideal platform for consolidation. Scale-out systems help IT reduce management costs and footprint, which reduces floor space, and power and cooling costs. And because of the consolidation onto a shared resource, utilization rates are much higher, so users get more bang for their storage buck. The benefits that users report from deploying scale-out platforms are far reaching—starting with improved scalability, the core benefit of scale-out platforms, and improved performance and availability. But a number of benefits users report translate right into cost savings and the bottom line. Nearly a third of those users surveyed report they improved utilization, and more than one in four reported reduced operational expense, one in four reported they could manage more capacity with fewer people, and almost one in five reported reduced in capital expenditures. The financial impact can really add up. Scale-out storage architectures have come to dominate some market segments but have not yet gained prevalence in the midrange—midrange storage traditionally lags in the high end when it comes to adopting or leveraging new technologies, and this is no exception. But with richer file formats and ever increasing mountains of data, especially in the content rich market segments that Overland is targeting, scale-out is the only approach that makes sense. Overland’s move into this space is a good one. It has a strong channel presence that it can leverage to move up market—and it is not a big leap up market rather just a move into an adjacent space. This move is complementary to the existing SnapServer line and indeed it fits the existing channel well. The midrange scale-out market is underserved—currently dominated by bigger vendors’ scale-up solutions. As unstructured data continues to grow at a blistering pace, we expect that these scale-up systems may still find a home in file-based transactional environments but for fast growing, content rich environments and even home directories where richer file formats are likely to accelerate growth even more (think multi-GB PowerPoint files with high definition photos and video). That’s where the big data growth is, and this product is well suited to serve those needs with a scalable, easily managed solution. Stovepiped scale-up solutions just don’t make sense in these types of use cases. Of course Overland still has some work to do—this is the first salvo. It will need to add advanced features such as space-saving thin clones and synchronous replication, but those will come over time. But it has a talented team and a lot of core IP to pull from, so expect the product to evolve from gen 1 quickly. Overland also has a reputation for providing quality products, which should ease the fear of IT managers hesitant to be the first ones in the pool. And the SnapServer line has a reputation for ease of use and management—Overland leveraged that experience and has pulled in some of that technology into the SnapScale X2. Overall this seems to be a solid strategy and a solid announcement that should help Overland expand its market presence into some new (and data rich) use cases.